Ornamental gravel was used in some places for the plant beds – for reasons of design or function - as is the case here around the water and ventilation shafts. This design of this cuboid seat catches the eye and invites us to linger. The plant areas, separated by stone walls, are first covered with a ZinCo root-resistant WSF 40 sheet. 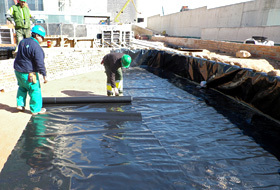 A protection mat ISM 50 is then added to the system build-up followed by the drainage layer. The substrate was applied accurately and efficiently from big bags. The required substrate depth varies from 20 to 100 cm, depending on the plants used. embedded steel meshes using straps. The reinforced load-bearing roof design allowed for driveways to be installed in addition to the intensive green roofing. The wooden bridge, also curved, leads the visitor onto the island in the middle of the pool. This impressive view from the hotel rooms across the gardens gives a particularly good sense of the architectural concept with its circular features and curved lines. The Le Méridien Oran Hotel & Convention Centre in Oran on the Mediterranean coast in the north west of Algeria is a new and spectacular building complex consisting of a convention centre and a five star hotel with adjacent gardens and sea-front promenade. 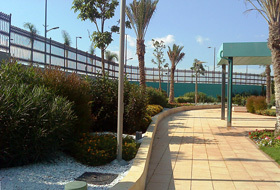 Of a total green area of 12,000 m² in the complex, approx. 4,500 m² are above the underground garage. 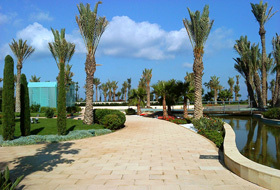 With ZinCo technology, it was possible to landscape this roof area to the same premium specification as those areas that are on firm ground – and seamlessly: with palm trees of up to 8 m in height on either side of a meandering pathway, blossoming plant beds and numerous water features and driveways. 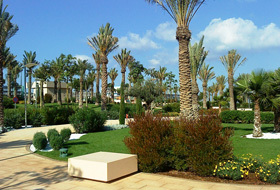 After a construction period of more than two years, the Le Méridien Oran Hotel was officially opened on 1 October 2011. The convention centre had already been completed and inaugurated in 2010. 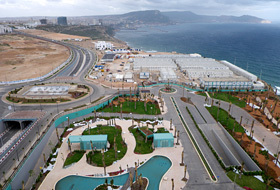 The dynamic city of Oran now has the largest convention centre in Algeria and one of the largest in Africa. The architectural group, IAC Arquitectura designed the auditorium with a capacity to cater for up to 3,000 delegates, the adjacent 22,000 m² exhibition centre and the 17-storey luxury hotel with 296 rooms, swimming pools, spa and fitness centres and a casino. The design is characterized by the intermingling of contemporary culture and the European heritage of the Le Méridien hotel chain. Due to the cliff-top location of the hotel, guests have a stunning view of the Mediterranean, the city of Oran and the gardens. Spanish expertise has found its way to Algeria in the form of OHL, a construction company active on the international stage that was appointed as contractors. OHL commissioned our experienced ZinCo partner in Spain, Jardinería Villanueva with the execution of the project. And so it came to pass, that in December 2009 a ship set sail from Valencia, laden with materials for gardens and green roofing, including substrate and plants, destined for use on a building site in Oran, a city 400 km away. 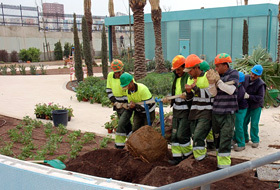 This enabled Jardinería Villanueva to carry out the landscaping work on the gardens and the green roof steadily and without delay over the weeks that followed. In order to be able to install the planned impressive gardens over an area that is not on firm ground, the structural design and construction technology had to be absolutely correct. The foundation was provided first of all by the right roof design for the 4,500 m² underground garage roof. The structural reinforcement of the concrete roof means that it can carry weights of up to 1,000 kg/m². This high load capacity allows for the installation of the desired intensive green roofing. As planned, passenger vehicles and trucks will also be able to travel across this roof area without a problem. The roof, sufficiently insulated and fitted with a root-resistant, bituminous waterproof barrier, has been equipped to deal with everything else. Stone walls, directly incorporated into the design of the roof, separate the pathways and driveways from the planting areas and the water features. 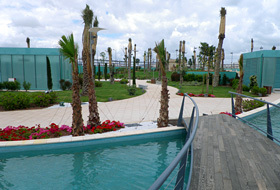 The planted areas were created using the ZinCo green roofing system “Roof garden”. 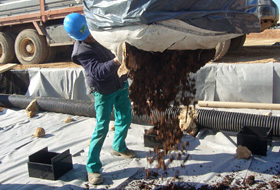 At the heart of this system build-up is the drainage and water storage element, Floradrain® FD 60. This is filled with the mineral substrate Zincolit® Plus, covered with the filter sheet SF and then with a layer of substrate that is particularly suited to the plants used. The substrate depth will vary from 20 cm to 100 cm, depending on the plant zone. As the substrate was supplied in big bags, it was brought to its destination quickly and efficiently with a crane. The entire parkland resembles a green oasis with a curved swimming pool at its centre. The 80 palm trees of the Phoenix dactylifera species give this green area its character. In addition, visitors will be enchanted by a further 220 trees, 2,000 bushes and shrubs and 38,000 perennials. A drought-resistant lawn of the species Cynodon dactylon, suited to the prevailing conditions, flourishes across an area of 10,000m². 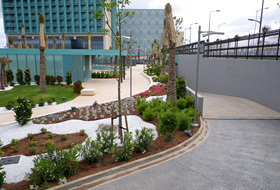 The plants were chosen by Jardinería Villanueva and are suited to the sub-tropical climate zone: In Oran, average temperatures are around 10 °C in the winter months and 25 °C in July and August. There is little precipitation in Oran, particularly from May to September and it is generally speaking only between 1 mm and 19 mm on average. The ongoing irrigation needs of the plants are provided consistently by a fully-automated irrigation system with drip lines and sprinkler – while the plants are taking root and subsequently. 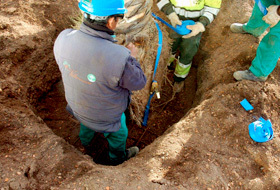 As the palm trees were already between 6 and 8 m in height at the time of planting, any handling work such as anchoring and securing them against wind suction proved very challenging. The palm trees, some of which had more than one trunk, were delivered using a low-loader and were lifted to the required location using a crane. Up to eight people were then needed at the same time to plant each tree. The large palm tree root balls were anchored with straps to a steel mesh embedded in the substrate. The palm trees and other trees are very secure, even in strong winds, thanks to this root ball anchor. The architecture of the gardens is characterised by circular features and curved lines. The circular design of the pool contributes considerably to this. The island in the middle of the pool is reached by a small wooden bridge. Even the driveways in the gardens have a number of eye-catching roundabouts: a multi-trunk palm tree at the centre of a fountain system welcomes arriving guests. This concept is extended by means of the meandering pathways through the gardens and the curving ornamental gravel areas within the plant beds. As ZinCo system build-ups allow for any design variation over an underground garage, the planners of Le Méridien Oran Hotels & Convention Centres can give free rein to their imagination. Inspiration and innovation are, so to speak, trademarks of this global hotel chain. For example, “Le Méridien LM 100” is a group of cultural visionaries and artists who aim to enhance a guest’s stay at Le Méridien. From painters to photographers, musicians to designers, chefs to architects – they will also, undoubtedly, be inspired by these fascinating gardens.